"Kino is a desperately poor Mexican-pearl diver. But when he finds 'The Pearl of the World' he believes that his life will be magically transformed. Obsessed by his dreams, Kino is blind to the greed, fear and even violence the pearl arouses in his neighbours - and himself." 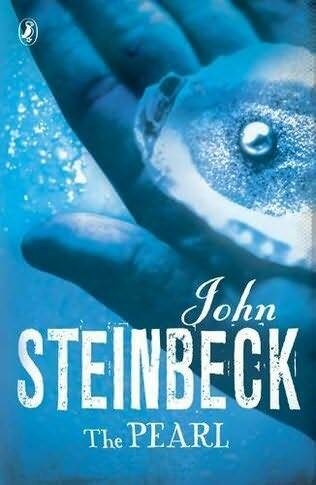 John Steinbeck is known for the scenic descriptions of desolate yet beauteous landscapes that he portrays. When combined with the moral dilemmas that his characters often face, or the grave situations in which they find themselves, their power is increased. This is equally true in The Pearl, where Kino's discovery of a valuable black pearl drives him to the desire to use it to change his family's life for the better. Barren Mexican panoramas are lit up by his love for his family and the simplest pleasures of his life, and just as quickly darkened by the increasing horror of his quest to sell the pearl. In many ways this is done to great effect: we, the readers, are on Kino's side, urging him on and longing for his success. As mentioned, the descriptions of emotions and the natural world are bewitching, and the short length of The Pearl means that the story's pace is kept taut throughout. However, it is all dashed to pieces almost from the start by our knowledge that Kino is doomed - if he is able to sell the pearl successfully, it will be an even shorter story than it already is, and as his agony is drawn out, we have the sinking feeling that there is less and less chance of it ending well. This is arguably the novella's weakness: in Of Mice And Men, which is almost as short, there was always a tantalising ambiguity and a chance that the dream could come true. It is clear early on in The Pearl, however, that this is unlikely to be the case. And yet we read on. Why? This is testament to the power of Steinbeck's storytelling. It's like seeing a film that's based on a book you've already read: you have a clear idea of how it will end, but you want to see how the director will portray it. In that sense, Steinbeck does step into that role of film director, painting clear visions in front of our eyes of Kino's flight from (and, simultaneously, towards) disaster - and it is therefore this magical quality that makes the story indeed a rare pearl.